Note from Sarah: The sample sock was knit with different yarns than those in the pattern, since we don’t have Woolease in Australia. I used DK weight Patons Fireside for the sock, Cleckheaton Country DK (red), and a scrap of green acrylic for the top of the peppers. 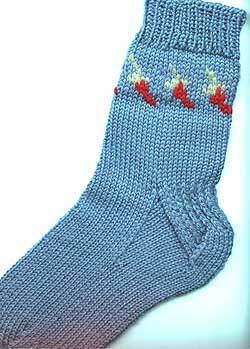 The basic sock is based on the instructions in Socka book #20. (Allow me to plug this book – it has a very clear, very good basic sock design for different weight yarns and different size feet). It will fit a “woman’s medium” (approximately a woman’s 8 U.S. size). 2 balls “Blue Mist” Wool-Ease (it took slightly under 100 g total, I would estimate). Cast on 48 sts with blue. Rib in K1 P1 rib for 12 rows. (sl 1, K1 on RS, p on WS) for 20 rows. End with a p row. Knit across all those sts, then pick up 14 sts on the side of the heel flap, knit across the instep sts, then pick up another 14 sts on the other side of the heel flap. Knit to last 2 sts on needle one, then k2tog. Knit instep sts. Then on Needle 4, SKP and then knit to end. Knit two rounds. (or one round if you prefer a really fast “neck down” on the foot). Repeat this group of rounds until you again have 48 sts. The “Socka way” is to do this round, followed by 3 plain rounds, then two sets of the dec round followed by 2 plain rounds, then 3 sets of the decrease round followed by a single round, and then dec every round till 8 sts remain, where they are then Kitchenered. If you have a preferred dec method, use it.